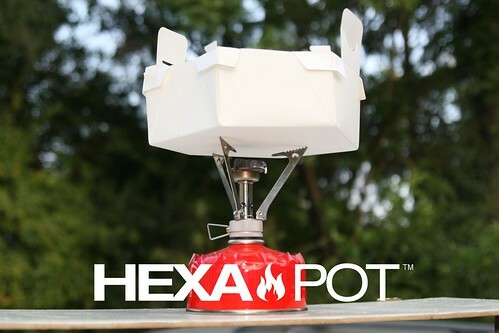 Hexa Pot™ is an eco-conscious disposable paper cooking pot for indoor/outdoor use. It is designed to be convenient, light-weight, easy to dispose of when you're on picnics, camping, backpacking, on the go, or traveling. One of many reasons for using a Hexa Pot™ instead of using traditional pots is to save time. Instead of having to wash the pots, you can toss them in the recycle bin trash. Time you would spend scraping, rinsing, washing and putting them away can be used for other things instead. The Hexa Pot™ is formed in a hexagon shaped design for a stabilized base and is made from a special non-toxic waterproofing multi-ply paper material to prevent liquid from leaking out or soaking through the paper. The Hexa Pot™ can be easily stowed away into a backpack as a result of its resourceful space-saving collapsible design. When ready to use, just easily unfold and expand to make the hexagon formed shape.